Welcome to Chicago's McCormick Place, the premier convention facility in North America. Located just minutes from downtown Chicago, McCormick Place attracts close to 3 million visitors each year. 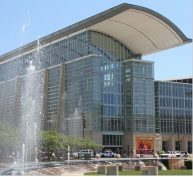 McCormick Place is comprised of four state-of-the-art buildings: the North and South Buildings, the West Building and Lakeside Center. Together, they form what many consider to be the economic engine that powers the entire convention and tradeshow industry. McCormick Place is committed to creating a great experience for every person, every time. We always recommend you stay in one of our preferred hotels when you attend World Routes. Not only will you enjoy discounted rates, you’ll also find dedicated World Routes information desks where you can get advice and information on all the event details. There is a dedicated Busway running from many of the preferred Routes hotels straight to McCormick Place. To view the location for all official Routes hotels click here to download the hotel map. Or book now! We have recently been made aware of a fraudulent hotel booking company who are contacting exhibitors and claiming to be either a preferred supplier or, in some cases, working for the show/exhibition itself. We would urge all registered delegates to be vigilant and cautious of any such communications. The Official Hotel Booking Agency/Accommodation Partner for World Routes 2014 is Events in Focus, please choose from the links below to make your hotel reservation. Situated just steps from Michigan Avenue, the Fairmont Chicago, Millennium Park is one of the Windy City’s most stylish and unique luxury hotels. Spacious rooms and suites offer the essence of urban luxury. Enjoy fashionable restaurants, the indulgent mySpa and a cutting-edge fitness studio. Step outside and the best of Chicago beckons - from Grant Park, the Navy Pier and the Magnificent Mile to the scenic ribbon of shoreline along Lake Michigan. 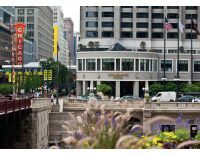 Set within the epicentre of the city, AAA Four Diamond Hyatt Regency Chicago is conveniently connected to the Illinois Center and within minutes of the Magnificent Mile. Sway to the electrified beat of Chicago blues and jazz greats, take in a show at Navy Pier, shop on Michigan Avenue, or enjoy a day in the park or on the water. This cosmopolitan downtown Chicago hotel is central to it all. Take in the incredible views of downtown, Lake Michigan and the Museum Campus from contemporary guestrooms. Savour a variety of delicious cuisines in the popular McCormick Place hotel restaurants. Relax in the indoor pool and StayFit™ fitness centre. The hotel is connected via enclosed sky-bridge to McCormick Place. Among downtown Chicago hotels, the Renaissance Blackstone stands out as one of the finest and most elegant. Located on Michigan Avenue near Grant Park and a mere three blocks from Lake Michigan, you’ll find yourself in the most convenient location for visiting Chicago’s celebrated sights. The Art Institute of Chicago, Navy Pier, Millennium Park, Shedd Aquarium and the Field Museum are all within minutes of the hotel. Revitalise body and mind in spacious rooms or suites featuring unique amenities with marble accents complemented by skyline views of the city’s architecture. Experience Bar Novo, a downtown Chicago hotel setting unlike any other providing a trendy and distinguished night-life scene and serving delectable dishes and creative cocktails. This boutique hotel is steps away from upscale shopping, fine dining and iconic Millennium Park. Swissôtel Chicago, designed by renowned Chicago architect Harry Weese, is an award winning, four-diamond, all-glass triangular luxury hotel. Ideally situated in the confluence of the Chicago River and Lake Michigan and just steps away from exclusive shopping on The Magnificent Mile in downtown Chicago, with fabulous wrap-around views from Navy Pier to Millennium Park, Swissôtel Chicago offers an exclusive setting with one of the city’s most prestigious addresses.